•Tour six amazing homes, including one filled floor to ceiling with kitschy, collected goodness. Baby rattles, anatomy charts and dental molds (yes, teeth!) all live in harmony. Also meet a Texas shop owner who fell in love with his small hometown—and house he’s remodeling—all over. •Tag along on a shopping spree with humorist Charles Phoenix (aka Ambassador of Americana) as he hits up the vintage stores along Retro Row in Long Beach, California. Midcentury is on our minds! •Revisit board games we knew and still love—from classics like Candy Land to teen faves like Mystery Date, a 1960s game of chance and romance. With any luck, you’ll find a dreamboat waiting behind the white plastic door. •Reel in some cool home decor by repurposing old fishing gear—perfect for a cabin or kid’s room. Or get crafty turning thrifted baskets and woven finds into textural art, mobiles and more. 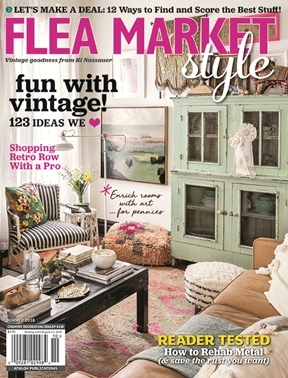 •Make your summer thrifting the best ever with 12 tips from style expert and flea market pro Emily Henderson. She tells how to snag the deals and keep you focused as you shop.